A little over a month since the earthquake and tsunami that devastated Northeast Japan, the disaster-stricken areas continue to receive support in a variety of forms from across the country. Even so, the full extent of the damage remains unclear. There are still over 15,000 people unaccounted for, and heavily crippled infrastructure has caused a scarcity of supplies, slowing down reconstruction efforts. It seems there is still a long away to go before the disaster victims will see a return to normalcy in their lives. Staying true to their “mission as a convenience store,” major chain Lawson has announced that they will begin mobile retail operation to deliver their products to areas suffering from supply shortages. Earlier this April we made our way to Fukushima to do some investigative reporting of the current conditions in the five- to ten-kilometer area around the Fukushima Dai-ichi Nuclear Power Plant. In our last two reports we covered the scene of a ranch where abandoned cattle had been left to starve and the efforts of a special team dispatched to rescue pets. For our third report we’d like to share what we saw as we made our way through the city of Minamisōma, which suffered heavy damage from the earthquake and tsunami. As much of the city lies within the 20 km government-mandated evacuation zone, most residents have been forced to leave and remain unable to begin the reconstruction of their town. Following our last report of abandoned cattle being left to starve, this is the second in a series of articles where we report our findings from our time on the ground in Fukushima. This time our reporters followed a rescue team formed by several animal protection groups working in the town of Namie, Fukushima who had been requested by residents to save pets left behind by their masters. Earlier this April we made our way to Fukushima to do some investigative reporting of the current conditions in the five- to ten-kilometer area around the Fukushima Dai-ichi Nuclear Power Plant. This is the first in a series of articles where we will report our findings from our time on the ground in Fukushima. The location for our first story is a ranch in Namie, a town located 10 kilometers from the nuclear plant. Here, instead of the lively sounds of farmers going about their daily work, the air is filled with the desperate cries of abandoned cattle. Going to the barn to investigate, we found that over half the cattle in every pen were dead, and the rest were letting out heartbreaking cries for help as they stood among the corpses. Nearly one month after the massive earthquake and tsunami that devastated Northeast Japan, most people in the country have returned to their normal daily routines. Yet the reality is much different for those living in the disaster-stricken areas, and millions of people continue to suffer. On Hatelabo, a website where users can post and comment on journal entries anonymously, one post is causing commotion for shedding some light on just how different that reality may be. The band Inawashirokos, formed after last month’s earthquake by a group of four Fukushima-born musicians from well-known bands, have released their first single, I love you & I need you Fukushima. The song sends a message of support from all of Japan to the Fukushima prefecture, which was one of the areas hardest hit during the earthquake and continues to grapple with the unfolding nuclear crisis. The United States National Environmental Satellite, Data, and Information Service (NOAA) has released satellite images of nighttime Japan taken immediately before and after the earthquake that struck on March 11th. 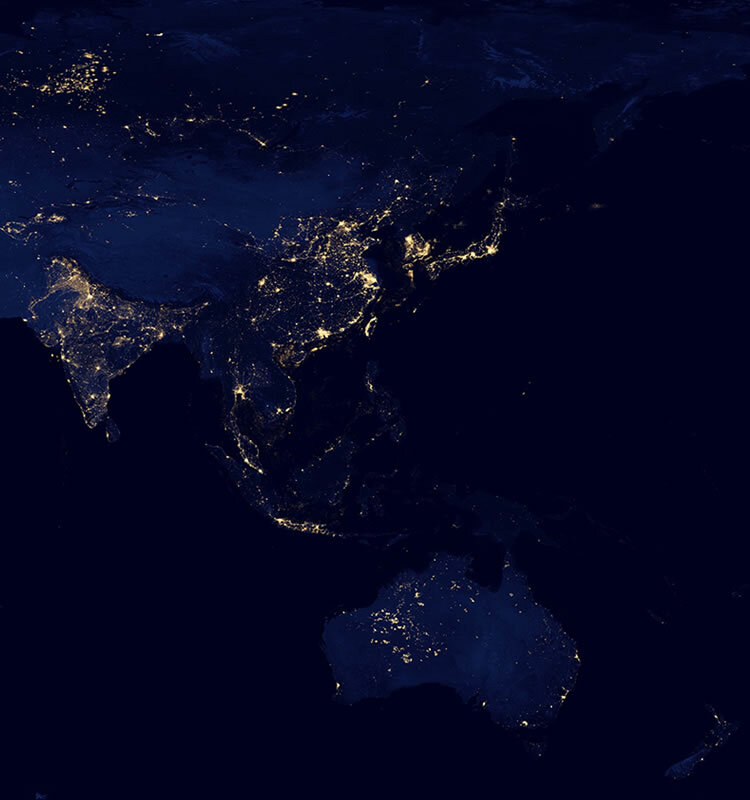 Though Japan is normally conspicuously brighter than surrounding countries when seen at night, the photos show a much darker country, and give a unique view of how the entire country was affected by the power outages cause by the earthquake and tsunami. According to police reports, there are still more than 16 million people living in refugee shelters after last month’s earthquake as of April 4th. The shelters, though a step up from complete homelessness, are far from bastions of comfort. Hundreds of people are living under the same roof, their privacy guarded only by makeshift cardboard partitions. Thanks to relief efforts some basic necessities are made available, but people continue to struggle in the absence of everyday goods. While those displaced by the earthquake have nothing to do but wait for a return to a normal lifestyle, a website designer known as NOSIGNER has created a wiki called OLIVE for users share practical ideas to help with life in the shelters. American apparel brand, J. Crew, sold t-shirts meant to benefit those people affected by the recent disaster in Japan, however they ended up generating controversy over the design. The design consisted of a map of Japan that included a reference to the “Sea of Japan”. The reference angered Korean customers, who argue that the geographic feature should be renamed the “East Sea”, and they then complained vociferously on the internet. In response, J. Crew removed the t-shirt from shelves. J.Crew announced that they stopped the sales of the shirt and had made plans to change the design. The product page cannot be found anymore on their website. In response to the changes, Korean internet users posted declarations such as, “They should have acted faster”, and “We should keep an eye on their new design too”. In March the Japanese Ministry of Health announced that it had detected radiation levels exceeding safety standards in vegetables from Fukushima and the neighboring prefecture of Ibaraki. Despite government efforts to assure the public that no contaminated products had been shipped to supermarkets, consumers across Japan have been spooked from buying produce from the affected areas. As a result, farmers in Fukushima and Ibaraki—even those whose crops remain uncontaminated—are struggling to cope with financial insecurity as they face a sudden drop in demand. In response, a farmer’s market-like event titled “Blow Away Restrained Buying! Support Fukushima and Ibaraki Farmers!” has been launched to calm public radiation fears by inviting farmers from these regions to Tokyo to sell their produce directly, and have customers test for radiation themselves. Japanese telecommunications and media conglomerate Softbank Group announced on its website that its CEO Son Masayoshi will personally donate US$120 million, as well as his entire salary until retirement, to assist the victims of last month’s earthquake and tsunami. A young mother’s blog containing entries of her inability to love her four-year-old daughter is creating controversy in Japan. With a death toll exceeding 2000, the coastal town of Ishinomaki, Miyagi was one of the hardest hit during the Tohoku Earthquake and resulting tsunami. Here, in the aftermath of the disaster, 15-year-old Shuuya Kikuchi spent hours wading through ice-cold water and rescuing elderly people trapped in their cars. Major chain convenience store, Lawson, has stated that it is prioritizing the delivery of food from distributors across over the country to refugee shelters and stores in the earthquake-affected Touhoku region.